مدنی, رامین, عینی‌فر, علیرضا, جاد, بروس, جلیلی, محمد. (1397). تبیین عوامل مؤثر بر شکل‌گیری حس‌تعلق اجتماعی در مجموعه‌های مسکونی محصور، مورد مطالعاتی: مجموعه‌های مسکونی شهر همدان. معماری و شهرسازی آرمان شهر, 11(25), 163-176. رامین مدنی; علیرضا عینی‌فر; بروس جاد; محمد جلیلی. "تبیین عوامل مؤثر بر شکل‌گیری حس‌تعلق اجتماعی در مجموعه‌های مسکونی محصور، مورد مطالعاتی: مجموعه‌های مسکونی شهر همدان". معماری و شهرسازی آرمان شهر, 11, 25, 1397, 163-176. مدنی, رامین, عینی‌فر, علیرضا, جاد, بروس, جلیلی, محمد. (1397). 'تبیین عوامل مؤثر بر شکل‌گیری حس‌تعلق اجتماعی در مجموعه‌های مسکونی محصور، مورد مطالعاتی: مجموعه‌های مسکونی شهر همدان', معماری و شهرسازی آرمان شهر, 11(25), pp. 163-176. مدنی, رامین, عینی‌فر, علیرضا, جاد, بروس, جلیلی, محمد. تبیین عوامل مؤثر بر شکل‌گیری حس‌تعلق اجتماعی در مجموعه‌های مسکونی محصور، مورد مطالعاتی: مجموعه‌های مسکونی شهر همدان. معماری و شهرسازی آرمان شهر, 1397; 11(25): 163-176. 1استادیار معماری، دانشکده معماری و شهرسازی، دانشگاه هنر اصفهان، اصفهان، ایران. 2استاد معماری، دانشکده معماری، پردیس هنرهای زیبا، دانشگاه تهران، تهران، ایران. 3استاد معماری، دانشکده معماری، پردیس محیط ساخته شده، دانشگاه نیوساوت ولز، سیدنی، استرالیا. 4دانشجوی دکتری معماری اسلامی، دانشکده معماری و شهرسازی، دانشگاه هنر اصفهان، اصفهان، ایران. از چند دهه پیش تاکنون، ظهور و گسترش مجموعه‌های مسکونی برنامه‌ریزی شده با محدوده‌های سخت و قابل کنترل، به نام مجموعه‌های مسکونی محصور و بحث درخصوص پیامدهای اجتماعی زندگی در آن‌ها، توجه پژوهشگران را به خود جلب کرده است. 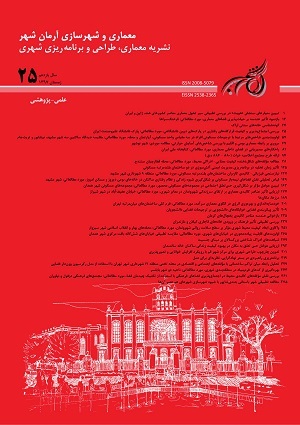 در ادبیات مسکن‌سازی، اختلاف‌های زیادی در خصوص ادراک حس‌تعلق اجتماعی، به‌عنوان شاخصی برای کیفیت زندگی اجتماعی ساکنان مجموعه‌های مسکونی محصور وجود دارد. مطالعات نشان می‌دهند که مجموعه‌های مسکونی محصور می‌توانند هم موجب افزایش و هم کاهش حس‌تعلق اجتماعی شوند. با توجه به کارکردهای مهم حس‌تعلق اجتماعی، این پژوهش سعی کرده است نگاه دقیق‌تری به عوامل مؤثر بر شکل‌گیری و ارتقاء آن در مجموعه‌های مسکونی محصور داشته باشد. در این تحقیق، با استفاده از روش پیمایش و بهره‌گیری از شیوه نمونه‌گیری خوشه‌ای و توزیع پرسش‌نامه، حس‌تعلق اجتماعی 360 نفر از ساکنان بالای بیست سال، سه مجموعه مسکونی محصور در شهر همدان تحلیل شده است. یافته‌ها نشان می‌دهد متغیرهای پیوند اجتماعی محلی، اعتماد و کنترل اجتماعی، احساس امنیت، مدت اقامت، استفاده از فضای عمومی و وجود کاربری‌های مختلط، رابطه معناداری با حس‌تعلق اجتماعی دارند. مطابق نتایج تحقیق، میزان حس‌تعلق اجتماعی در میان ساکنان مجموعه‌های مسکونی مطالعه شده، در حد بالایی نیست. نتیجه تحقیق، تأییدکننده آن دسته از دیدگاه‌های مخالف در ادبیات است، که بر روی هزینه‌های اجتماعی مجموعه‌های مسکونی محصور تأکید می‌کنند. بر این اساس، مجموعه‌های مسکونی محصور می‌توانند یک مانع در برابر تعامل باشند و ممکن است بر مشکلات ایجاد شبکه‌های اجتماعی که فرصتی برای فعالیت‌های اجتماعی و اقتصادی فراهم می‌آورند، بیفزایند. Altman, I., & Wohlwill, J.F. (2012). Human Behavior and Environment: Advances in Theory and Research. Springer Science & Business Media, 2. Amirkafi, M., & Fathi, Sh. (2011). Investigating Factors Affecting Attachment to Neighborhood Case Study: Kerman City. Journal of Iranian Social Studies, 5(1), 1-26. Atkinson, R., & Blandy, S. (Eds.). (2013). Gated Communities: International Perspectives. Routledge. Austin, D.M., Furr, L.A., & Spine, M. (2002). The Effects of Neighborhood Conditions on Perceptions of Safety. Journal of Criminal Justice, 30(5), 417-427. Bell, P.A., Greene, T.C., Fisher, J.D., & Baum, A. (2005). Environmental Psychology. Psychology Press. London. Blakely, E.J. (1999). The Gated Community Debate. Urban Land, 58, 50-55. Blakely, E.J., & Snyder, M.G. (Eds.). (1997). Fortress America: Gated Communities in the United States. Brookings Institution Press. Blandy, S. (2018). Gated Communities Revisited: Defended Homes Nested in Security Enclaves. People, Place & Policy Online, 11(3). Brodsky, A.E., & Marx, C.M. (2001). Layers of Identity: Multiple Psychological Senses of Community within a Community Setting. Journal of Community Psychology, 29(2), 161-178. Buckner, J.C. (1988). The Development of an Instrument to Measure Neighborhood Cohesion. American Journal of Community Psychology, 16(6), 771-791. Byers, M. (2003). Waiting at the Gate: The New, Postmodern Promised Lands. Suburban Sprawl: Culture, Ecology and Politics Eds H Bartling, M Lindstrom (Rowman and Littlefield), Lanham, MD, 23-44. Campbell, K. E., & Lee, B. A. (1992). Sources of Personal Neighbor Networks: Social Integration, Need, or Time?. Social Forces, 70(4), 1077-1100. Chavis, D.M., & Pretty, G.M. (1999). Sense of Community: Advances in Measurement and Application. Journal of Community Psychology, 27(6), 635-642. Chavis, D.M., & Wandersman, A. (1990). Sense of Community in the Urban Environment: A Catalyst for Participation and Community Development. American Journal of Community Psychology, 18(1), 55-81. Chipuer, H.M., & Pretty, G.M. (1999). A Review of the Sense of Community Index: Current Uses, Factor Structure, Reliability, and Further Development. Journal of Community Psychology, 27(6), 643-658. Cowan, R., & Hall, P.G. (2005). The Dictionary of Urbanism. Tisbury: Streetwise Press, 67. Davidson, W.B., & Cotter, P.R. (1986). Measurement of Sense of Community within the Sphere of City1. Journal of Applied Social Psychology, 16(7), 608-619. Ellin, N. (1997). Architecture of Fear. Princeton Architectural Press. Foucault, M. (2007). Security, Territory, Population. Lectures at the Collège de France, 1977-78. Springer. Gehl, J. (2013). Cities for People. Island Press. Gifford, R. (2007). Environmental Psychology: Principles and Practice. Colville, WA: Optimal Books. Gifford, R. (Ed.). (2016). Research Methods for Environmental Psychology. John Wiley & Sons. Glynn, T.J. (1986). Neighborhood and Sense of Community. Journal of Community Psychology, 14(4), 341-352. Grant, J.L. (2007). Two SSides of a Coin? New Urbanism and Gated Communities. Housing Policy Debate, 18(3), 481-501. Grant, J., & Mittelsteadt, L. (2004). Types of Gated Communities. Environment and Planning B: Planning and Design, 31(6), 913-930. Greenberg, S.W., & Rohe, W.M. (1984). Neighborhood Design and Crime: A Test of Two Perspectives. Journal of the American Planning Association, 50(1), 48-61. Hill, J.L. (1996). Psychological Sense of Community: Suggestions for Future Research. Journal of Community Psychology, 24(4), 431-438. Jacobs, J. (1961). The Death and Life of American Cities. New York: Routledge. Judd, D. (1995). The Rise of New Walled Cities. In Spatial Practices. H. Ligget & D. C. Perry, eds. 144-165. Thousand Oaks: Sage Publications. Landman, K. (2000). Gated Communities and Urban Sustainability: Taking a Closer Look at the Future. In 2nd Southern African Conference on Sustainable Development in the Built Environment Strategies for Sustainable Built Environment, Pretoria, South Africa, 23-25. Landman, K. (2002a). Transforming Urban Spaces in South Africa: The Impact of Enclosed Neighbourhoods on the Urban Future. Transforming Rural and Urban Spaces in South Africa during the 1990s: Reform, Restitution, Restructuring, 205-225. Landman, K. (2002b). Gated Communities in South Africa: Building Bridges or Barriers. In International Conference on Private Urban Governance, Mainz, Germany, 649. Le Goix, R. (2005). Gated Communities: Sprawl and Social Segregation in Southern California. Housing Studies, 20(2), 323-343. Leyden, K.M. (2003). Social Capital and the Built Environment: The Importance of Walkable Neighborhoods. American Journal of Public Health, 93(9), 1546-1551. Low, S. (2003). Behind the Gates. New York and London: Routledge. Maxwell, D.K. (2004). Gated Communities: Selling the Good Life. Dalhousie University. McKenzie, E. (2003). Common Interest Housing in the Communities of Tomorrow. Housing policy Debate, 14(1-2), 203-234. McMillan, D.W. (1996). Sense of Community. Journal of Community Psychology, 24(4), 315-325. McMillan, D.W., & Chavis, D.M. (1986). Sense of Community: A Definition and Theory. Journal of Community Psychology, 14(1), 6-23. Nasar, J.L., & Julian, D.A. (1995). The Psychological Sense of Community in the Neighborhood. Journal of the American Planning Association, 61(2), 178-184. Obst, P., Smith, S.G., & Zinkiewicz, L. (2001). An Exploration of Sense of Community, Part 3: Dimensions and Predictor of Psychological Sense of Community in Geographical Communities. Journal of Community Psychology, 30(1), 119–133. Obst, P.L., & White, K.M. (2004). Revisiting the Sense of Community Index: A Confirmatory Factor Analysis. Journal of Community Psychology, 32(6), 691-705. Pedhazur, E.J. (1997). Multivariate Regression in Behavioral Research. Perkins, D.D., Florin, P., Rich, R.C., Wandersman, A., & Chavis, D.M. (1990). Participation and the Social and Physical Environment of Residential Blocks: Crime and Community Context. American Journal of Community Psychology, 18(1), 83-115. Pooley, J.A., Cohen, L., & Pike, L.T. (2005). Can Sense of Community Inform Social Capital? The Social Science Journal, 42(1), 71-79. Riger, S., & Lavrakas, P. J. (1981). Community Ties: Patterns of Attachment and Social Interaction in Urban Neighborhoods. American Journal of Community Psychology, 9(1), 55-66. Rogers, G.O., & Sukolratanametee, S. (2009). Neighborhood Design and Sense of Community: Comparing SubUrban Neighborhoods in Houston Texas. Landscape and Urban Planning, 92(3), 325-334. Roitman, S. (2010). Gated Communities: Definitions, Causes and Consequences. Proceedings of the Institution of Civil Engineers: Urban Design and Planning, 163(1), 31-38. Skjaeveland, O., Gärling, T., & Maeland, J.G. (1996). A Multidimensional Measure of Neighboring. American Journal of Community Psychology, 24(3), 413-435. Wilson-Doenges, G. (2000). An Exploration of Sense of Community and Fear of Crime in Gated Communities. Environment and Behavior, 32(5), 597-611. Zaireen, Z.A., Norhidayah, M.Y., Razali, M.N., Maslinda, A.L., Hussin, K., & Zakaria, S.R.A. (2015). The Typology of Gated Communities from Housing Developers’ Perspective. Advanced Science Letters, 21(5), 1247-1250.